Tomorrow will be the second anniversary of our son’s death. I am sharing the rough draft from a chapter in my book. I usually edit and re-edit my posts, but feel the need to be real and authentic today hoping it helps others open up their hearts in grief or for some to better understand those grieving. You are getting the raw footage. I hope this more journal-like entry will bless. While we all have different griefs and burdens to bear through our lives, losing a child is in the top 5 worse things that I could imagine happening. Despite my hope and faith, it is the worse pain and continues to be the worse pain I’ve ever had. My son, the one who punched my belly for nine months and made life energetic for our family for twenty-four years, still should be here. After two years, I still can’t get used to not hearing him say, “Love You!” when leaving for work in the morning or shouting, “Hi, Mama!” and bouncing in the door after work. Life is going on for all of us and some days I just don’t like it! I want him back! The first year I cried almost every day and didn’t feel bad about that because I was expected to cry. Every day I would fall at the feet of Jesus with my heart and sometimes with my body, almost moment by moment so I could breathe, teach, drive, and take care of my family. Waking up to read “God’s text” in my Bible phone app, each morning craving my Bible and sitting on Jesus’ lap was essential. Listening to our Christian radio, KTSY, got me from home to school each day so I could teach my students about worship. Every moment was an opportunity to hold the hand of Jesus and look for his touch in my life. Many of my posts shared about finding the balance between keeping my eyes on Jesus, but reminding myself that I still had my human feet on earth and needed to grieve. I thought after the first anniversary I should not cry as much. I was tired of crying! People around me were tired of my tears. The pain was still there but softer. I put my energy into work, family, and writing my book. Still having powerful unexpected moments of grief, I began to realize I needed to make sure I created margin in my life to grieve when it hit. I wanted to fight it but found that I couldn’t. When grief builds up in my heart, I must cry or I get a headache and feel like I’m going to have a heart attack or stroke. At first these building moments were every day, then once a week, with moments spreading out to once a month. Even sharing all the positive things in my life with others didn’t take away from the fact that I still needed to grieve. I began to embrace grief and like my friend, Jessica says, honor it. I learned I had to go to the feet of Jesus, admit my pain, ask him to wash the pain with his love, then drive to the cemetery or get out old photos and home videos and have a good long cry. After that, I could go on for another period of time without deep pain, still walking with my Lord in mind throughout my days. On this second anniversary of Taylor’s home going I am reflecting on the beauty of grief and all the good it brings. May brought a very busy schedule with the ending of school and I realized I wasn’t going to the feet of Jesus intentionally like I did when Taylor’s death was fresh and raw. I told the Lord I wanted to desire that depth again but was afraid of asking for it and suffering another tragedy. I felt peace in asking him and being honest with him, trusting he wouldn’t give me more than I could take. I returned last month from a trip to Seattle to see my family. I had some wonderful reunions with family but also had to see the stress my immediate family is under in caring for my ailing mom. I began to grieve for her, for them, and all the answers we need for helping her. It was a new kind of grief that exhausted me. Being there for three weeks, an intense ache grew in my heart for Gary and home. I was weak and needed God and my husband like I had never needed before. With not much strength, I then returned to Boise and began to mourn for Taylor deeper than I had in a long time as we passed what should have been his second wedding anniversary. My prayers had been answered for God to give his wife, Michelle, a wonderful fiancé that would love her and the Lord. In my mind, my immense joy over this should over shadow Taylor’s death as it had been doing since their engagement in January. I couldn’t understand why I was almost feeling the raw bitter pain of his death again. Then I realized the beauty of grief in that moment was that God had answered my prayer and I was drawn to be with him intimately at his feet, on his lap, in his Word, just worshiping him for who he is and receiving that love that can only come from him. Up until this time, Gary and I had been grieving on different time lines and not together. When I got home we began to grieve together, he was now the strong one holding me up and encouraging me. Grief not only drew me again to God but to my husband. I allowed myself to be broken and not insist on being the strong one. The brokenness I felt was a freeing relief to admit that I didn’t always have to have it all together. It was the release of a burden and a blessing to our marriage to allow Gary to share in my pain. After crying for a week around the wedding anniversary, I started my two summer jobs and got distracted a bit from my sorrow. It’s not a bad thing, but it did make me think I would get through this weekend without crying. Thursday, I realized it was two years since the last time I had seen Taylor. Yesterday, Saturday the 18th, was the anniversary of the last time I spoke to him on the phone arranging a time for him and Michelle to give us their gifts from Maui and I began to get the ache in my heart again and knew I’d need to go to the cemetery after church on Sunday. Today, planning to make it to church, I began to cry realizing I needed to go to the cemetery this morning or I’d just cry all morning in church. Deciding to go to the grave site, a fleeting thought came to me that I would like to see a young couple, Thom and Jessica, I’d met at the cemetery who had lost a baby a month after Taylor died and was buried near him. They had a new baby and I wanted to see her. I had hoped to take some of the lilies that we had planted for Taylor’s and Michelle’s rehearsal dinner. They didn’t bloom for that event but bloomed the week of his death. Yesterday the white ones were wilting and the pink Star Gazer lilies were not open. Getting ready today, I decided to take my favorite roses that my Grandma Bernice had introduced to me, Peace Roses. They emit a rich deep peachy smell and spark something in my heart when I look at them and hold them reminding me of my grandma. As I walked out the back door with my clippers, I looked towards the white lilies and the Star Gazer lilies were in bloom! I couldn’t keep my tears of gratitude from falling as I went out and clipped two of them. God was so good. 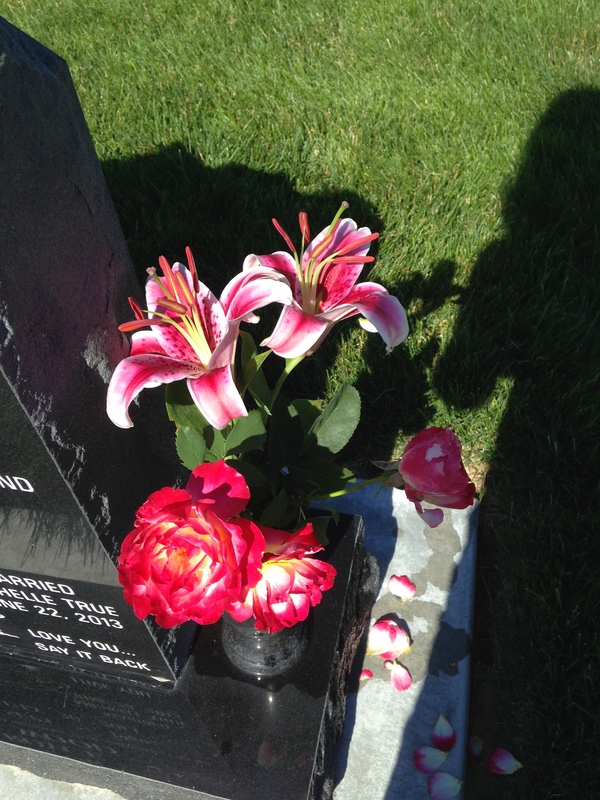 Gathering up my flowers and some things to clean Taylor’s stone, I began my thirty minute drive. Normally, I drive and cry then the tears turn off as I arrive at the cemetery. This time, they didn’t turn off. I continued to cry as I wiped Taylor’s stone off in the warming morning sun. I felt like I did when stroking his feet when he died and like I did when I was caring for him as a baby, changing his diaper or giving him a bath. It was an act of serving him in a way that brought comfort to my mama heart. I told him how much I missed him still and ached for the day of Christ’s return. I read his scripture, Romans 8:38-39, on the back of his stone next to his picture with confidence and faith knowing Taylor was happy and I would see him again. I talked to God but can’t tell you what I said in words. Words from my heart emitted from my spirit as I cleaned knowing the Spirit was praying for me. After arranging the flowers and organizing my things, I looked over to where my friends, Thom and Jessica’s baby was buried and they were there with their new little one! They had gone to church and decided on a whim to come up to the cemetery. We had a wonderful conversation and they ministered to me in my sorrow today. They are the younger ones and God used them to touch this grandma’s heart in sweet ways. Grief beautifully brings people together and expands our ability to love. I’m having lunch with Michelle tomorrow. I’m not sure how tomorrow will go but I will allow waves of grief flow and welcome them knowing beauty comes, not from my strength, but from my brokenness as I allow my hurting heart to open up and let God, Gary and others love on me.